Cast your mind back to May 1977, when Star Wars exploded into movie theaters! In those days, movies were shown in theaters much longer than they are today, for there was no mainstream home video market to speak of. Star Wars drew moviegoers to theaters for months after its release, and many of these people were repeat customers. If you saw it once, you had to see it five, ten, twenty times! The film was to be pulled from theaters in July 1978, but the crowds kept coming, so its first theatrical run was extended into November 1978. It was a sad day when Star Wars finally disappeared from movie screens, let me tell you! 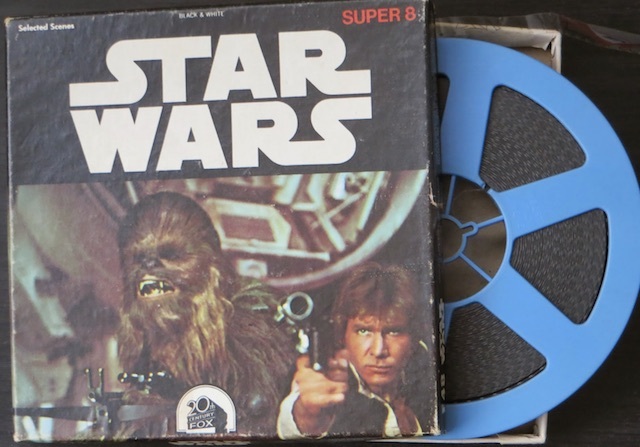 Super 8 version of “Star Wars” with selected scenes. 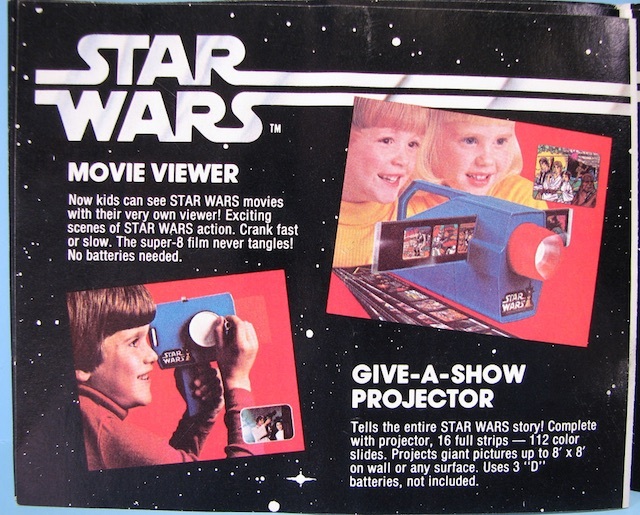 Kenner “Star Wars” movie viewer and projector. One reason people turned out in such numbers was that they couldn’t relive the Star Wars experience any other way than buying a ticket. Today, DVDs, Blu-Rays, and on-demand streaming mean we can enjoy our favorite movies anytime we want; but back in 1977, fans didn’t have these options. Oh, there was a little known Super 8 version of selected scenes kicking around; and Kenner released two different movie viewer toys that showed scenes from the movie. These were fun novelties, but they couldn’t deliver the full Star Wars experience. And the first VHS edition of Star Wars wasn’t released until 1982! 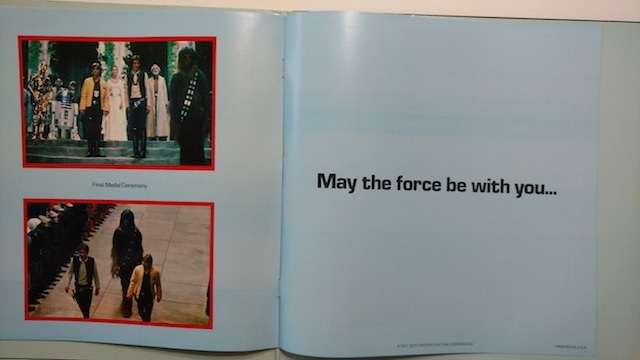 “Star Wars” VHS was released in 1982. 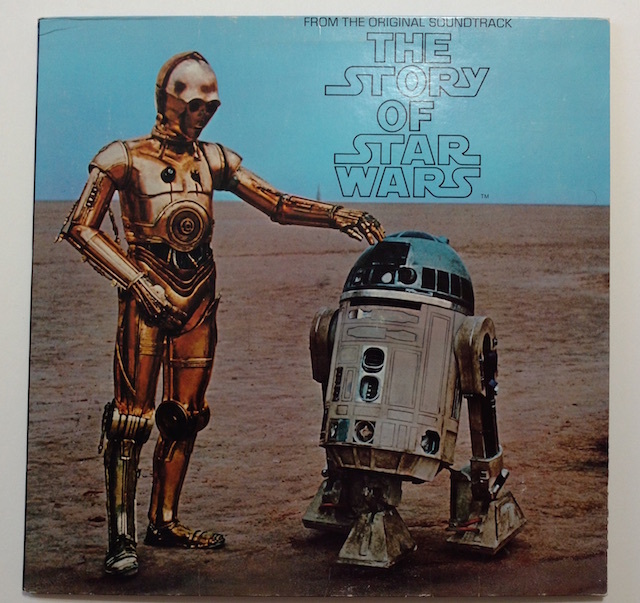 Thankfully, Star Wars addicts did have one great option to enjoy their favorite movie all over again: an LP record called The Story of Star Wars. 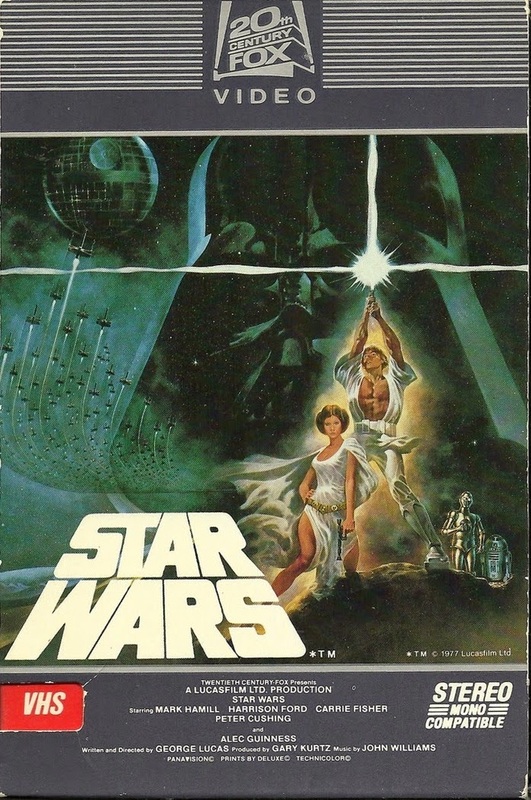 This album appeared in 1977 and contained a condensed version of the movie using actual dialogue and John Williams’s explosive film score. It was as close as rabid fans could come to reliving their favorite Star Wars scenes in the comfort of their own homes. I remember getting this for Christmas in 1977. The second I ripped off the wrapping paper, I ran upstairs and put it on the record player in my bedroom. That 20th Century Fox fanfare washed over me, and it was like being in the theater all over again! 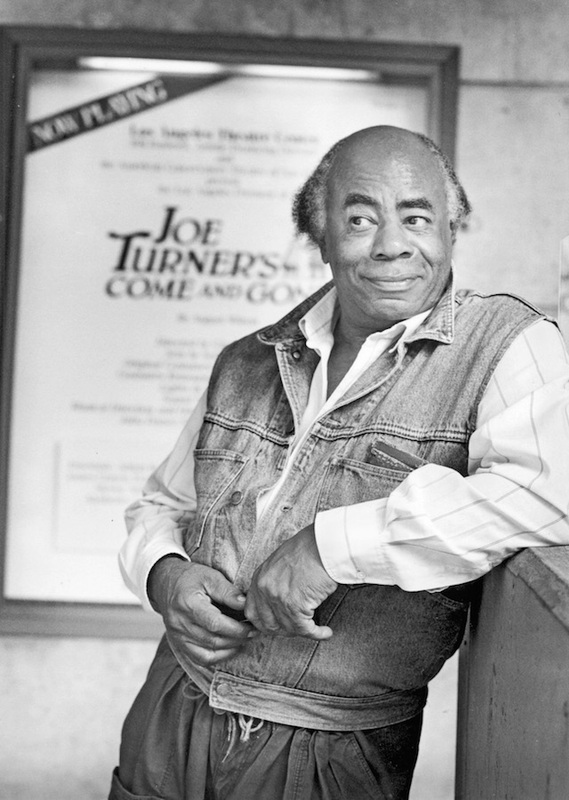 Roscoe Lee Browne narrates “The Story of Star Wars” LP. 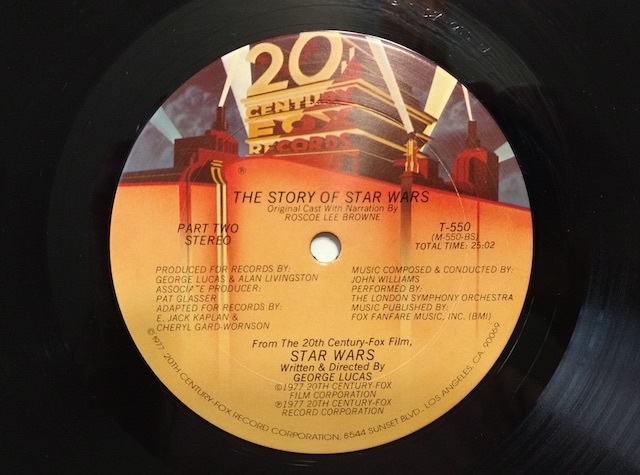 The original 1977 “The Story of Star Wars” LP label. The album credits and opening page. The voice actors on the “Star Wars” soundtrack. The album ran just over 50 minutes and featured narration by Roscoe Lee Browne. Browne’s rich baritone voice lent just the perfect tone of authority and drama to the epic Star Wars story. As the robots escape in the pod, a dark presence enters the ship: the ominous commander of the Imperial forces – Darth Vader, tall and threatening in his black helmet, flowing black cape, and a face forever masked by a foreboding metal breath screen; Darth Vader, a figure who moves forever in a cloud of awesome evil. Luke follows Ben into a murky, smoke-filled den serving an incredible array of weird and exotic aliens, monsters and disreputable humans: one-eyed, thousand-eyed, spiny, furry, scaly tentacles and claws are huddled over drinks. For those of us who listened to the record over and over, Browne’s narration became part of our cherished Star Wars memories. Here’s some fun trivia regarding this record: It was produced using the theatrical mono audio track, which included a line that was eventually deleted from the movie. It’s in the scene in the Death Star where Han and Chewie are chased by stormtroopers. In the actual movie, Han and Chewie leap through a set of closing blast doors, and a stormtrooper says “Open the blast doors! Open the blast doors!” When the movie was released in Special Edition format in 1997, this scene included a stormtrooper saying “Close the blast doors!” just before Han and Chewie leap through, which sets up the gag of the second trooper’s line. Many Star Wars fans were outraged over what seemed like George Lucas tinkering with their beloved movie. 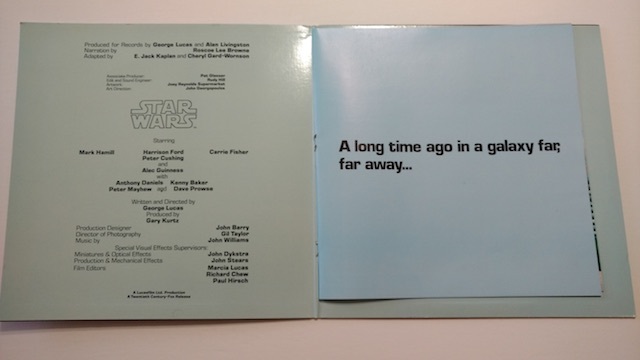 But Lucas merely restored the original line – which can be heard on The Story of Star Wars LP! An additional treat was a 16-page insert with color photos stapled inside the album cover. I remember flipping through this and following along with the action as the record played! 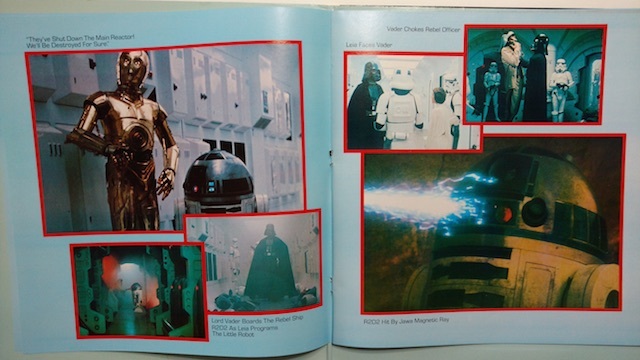 Movie scenes including Darth Vader boarding the rebel ship. Apparently, I wasn’t the only one who loved The Story of Star Wars. The LP reached gold record status, having sold over 500,000 copies. This early success means Star Wars fans and collectors can find this album online pretty easily today, and at affordable prices. You can even find digital audio of the record on YouTube if you want to listen to it without buying it. But if you’re any kind of Star Wars fan, whether you have a turntable or not, get a copy of The Story of Star Wars! 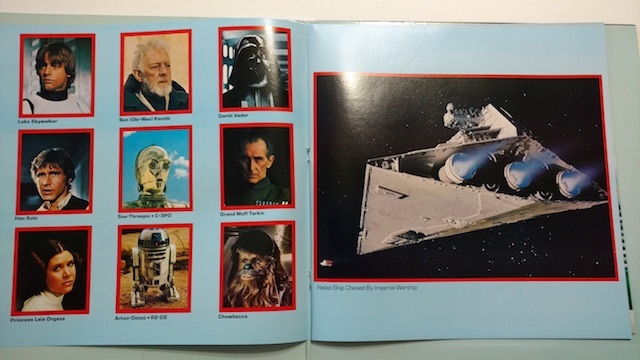 It’s a cool collectible that truly captures the fun and excitement of 1970s Star Wars mania. Closing scenes from “Star Wars”. Feel free to leave comments below, or share your own memories of listening to this awesome record. We’d love to hear from you!